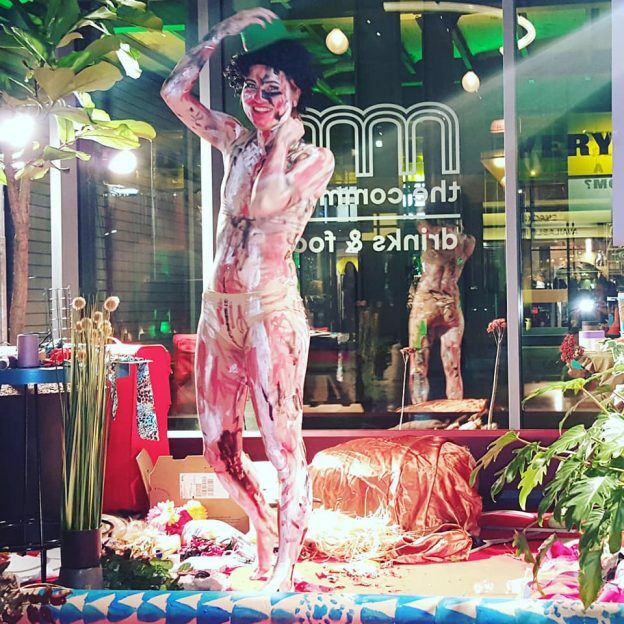 Artist Tanja Ritterbex made a performance especially for the opening of the exhibition Dreaming Awake in Marres, House for Contemporary Culture in Maastricht. Damp, humid, sticky, deafening and breathtaking that is the most invasive way for the jungle to force a landscape on us. Once your in there is no way out. The pressure of the environment is so powerful and hypnotising, it will bring visitors in a state of dreaming. The exhibition Dreaming Awake presents a version of a tropical rainforest in the Amazon area, that has been peeled off layer by layer. It is an exhibition about touching, with the emphasis on the touch by humankind through its surroundings. Dreaming Awake is focused on conveying that experience. The immersive project has been developed by the Brazilian curator Luiza Mello and Marres managing director Valentijn Byvanck in collaboration with artists Dominique Gonzalez-Foerster, Daniel Steegmann Mangrane en Luiz Zerbini. Dreaming Awake is the third in a series of immersive exhibitions. Former projects in this series were: Levi van Veluw: The Relativity of Matter (2015-16) en The Painted Bird | Dreams and Nightmares of Europe (2017). The opening of the exhibition took place on Friday 9 March, from 4 until 6 pm.